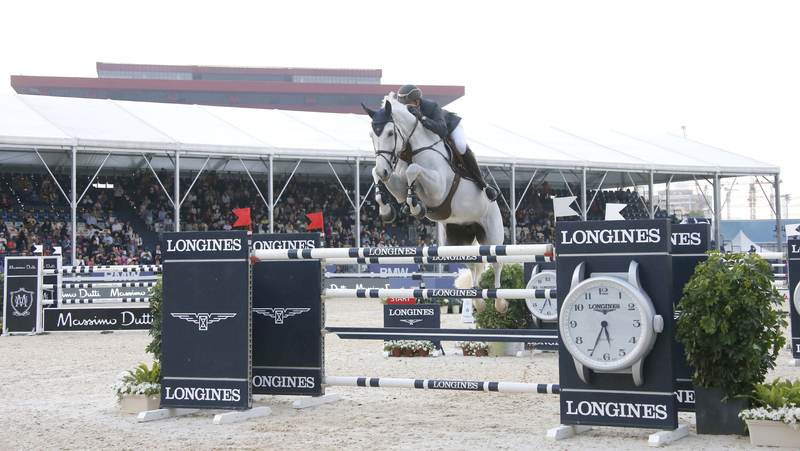 Belgium’s Gregory Wathelet and the gallant grey Coree set a jaw-dropping pace early in a 12 rider jump-off, seizing victory in the Longines Global Champions Tour Grand Prix of Shanghai. The pair nailed the feature class with a Formula-1-fast round that simply couldn’t be beaten, finishing 1.69 seconds ahead of their closest rival in the field. “I knew I had to take all the risks and she jumped amazing,” said Wathelet (BEL), before receiving a rapturous welcome as he stepped up on to the podium alongside runner-up Ben Maher (GBR) and Daniel Deusser (GER) in third. Wathelet also soars up the overall rankings to fourth where the 2018 Championship race is still headed by Brash, fifth here in Shanghai and bidding for his third overall title on the Tour. He sits just in front of another two-time Championship victor Edwina Tops-Alexander (AUS), who just missed out on a place in the jump-off when Inca Boy toppled a rail in round 1. Daniel Deusser now sits third, with Ben Maher fifth and all are no doubt hungry to grab more points as the Tour heads to Europe and the Spanish capital of Madrid in a fortnight. On a sultry afternoon in the buzzing metropolis in mainland China, fans, dignitries and celebrities took their seats for a massive day of sport and entertainment. The exhibition village attracted a bustling crowd as they shopped at the likes of Longines, Massimo Dutti and BMW. There was plenty also for families to enjoy and many golden photo opportunities — not least for the arrival of actress and Longines Ambassador of Elegance Lin Chi Ling, who led the glamour stakes among a stylish crowd of spectators, whose elegant hats could easily rival those seen at Royal Ascot. “It’s a big enough test, but with the best horses and riders here so the designer has no choice,” said Sameh El Dahan (EGY) as he walked the course — he later suffered heartbreak as the final fence fell in an otherwise immaculate round. A world class field of 32, with a global representation from Great Britain to Australia, qualified from the previous class and jumped in reverse order. With coverage on Eurosport, CNN and CCTV5 in China, the event was also live streamed to fans around the world. Several riders took the opportunity to showcase some of their up-and-coming Grand Prix horses, with some serious talent emerging on Tour. But such was the strength and depth of the field competing for a 610,000 euro prize fund that an impressive tally of 12 combinations landed a place in the jump-off, including two previous winners of this prestigious class, Harrie Smolders (NED) and last year’s winner Lorenzo de Luca (ITA). The spectators bristled with anticipation as the shortened course was set for this high-octane showdown. Shooting out of the starting gate came Scott Brash (GBR) on the exciting nine-year-old Hello Shelby and there was no hanging about as he pivoted round the bends, producing a smashing clear in 39.60s. Gregory Wathelet (BEL) and the lovely 12-year-old grey Corree followed in hot pursuit and taking out a daring stride to go full stretch over the final vertical, the pair slashed nearly 2 seconds off Brash’s time, flashing over the finish line in 37.91s. Two of Wathelet’s fellow countrymen then followed. Jos Verloy and Igor lost their chance for a podium place when the first fell fence before Niels Bruynseels and Cas De Liberte took just one chance too many and it was elimination when the mare ducked out for the second time. Maikel van der Vleuten (NED) finished second here last year and posted a respectable enough time of 41.38s on Idi Utopia to finish eventual seventh. Harrie Smolders (NED), the 2017 Champion and previous winner of the LGCT Grand Prix of Shanghai in 2015 with Regina Z, partnered the consistent stallion Don VHP Z this time around and looked bang on form once again, finishing just off the pace, clear in 40.52s. However, the race for a second championship is on in earnest for the Dutchman. Next up, Sheikh Ali Al Thani of Qatar riding Carolina made a game challenge over these mammoth fences in 39.46s, which placed him eventual fourth. Frenchman Simon Delestre is never to be underestimated but lost his chance for a medal when hitting the second fence with Gain Line. It was time for the final four. Ben Maher (GBR) and Explosion W, who were fresh from sealing victory for the London Knights in the GCL earlier in the afternoon drew gasps as an early fence rattled. But they put that nerve-jangling moment behind them and rocketed round the final bend to dash home just a fraction behind Wathelet in 38.55s. The British rider was followed by Danielle Goldstein of Israel. She nailed some daring turns before a couple of rails fell for Caspar. Wathelet was now guaranteed a podium place but faced an anxious wait for the final two combinations, both huge threats to the top of the leader board. Last year’s winner Lorenzo De Luca (ITA) came in with full focus but ultimately paid the price when Halifax hit the penultimate fence. Last to go, Daniel Deusser (GER), no stranger to the podium already this season and winner of the Grand Prix qualifying class, teamed up with the powerful Tobago Z, who relished the challenge. They took a gamble to every fence to rocket over the final fence in 39.11s, just fractions behind for third. Thus sealed a classic jump-off on a brilliant day’s jumping and the celebrations could begin for Gregory Wathelet and Coree. As the season gallops full pelt into Europe, the championship race is really hotting up, with the next leg on the thrilling Championship race kicking off in Spain’s capital city of Madrid. Jan Tops, LGCT Founder and President: “It doesn’t get much more exciting than it did today, it was amazing to the end and this line-up of three amazing riders — Daniel Deusser was last to go and he had a younger horse and he did a great job to come third. Also Ben Maher who finished second, also with a younger horse but today absolutely amazing was Gregory, he knew there was a lot of fast riders and he gave everything. It was his day, well done.